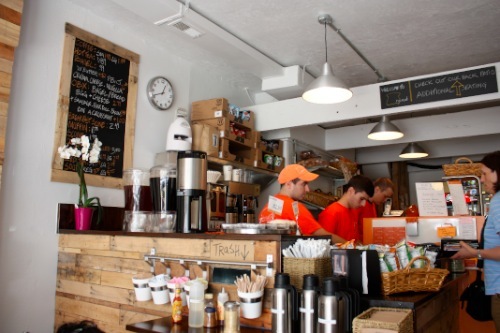 rybread cafe recently opened in Philadelphia’s Fairmount area. I had walked by the shop several times on missions to the nearby CVS, and I finally had the opportunity to stop in for lunch today with Lisa. The Fairmount area of Philadelphia, in my opinion, has been missing really great lunch spots. 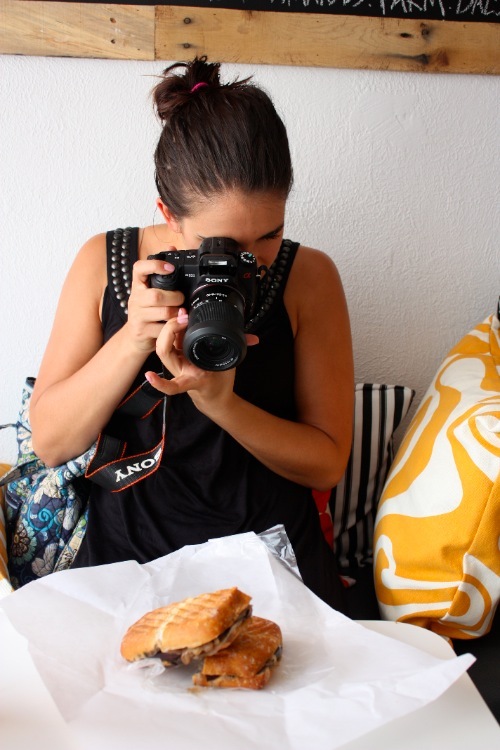 I could not wait to check out rybread to see if I had found my new favorite cafe! 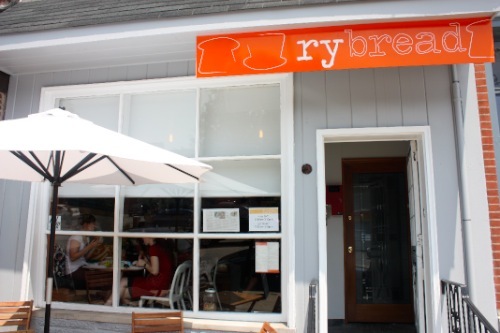 rybread is a small cafe right on Fairmount Avenue. They have a great full menu of sandwiches, panini, salads, coffee, and treats! The cafe was opened recently by a father son duo and is run by family and friends. There are a few tables out front, a few tables inside, and a nice patio in the back. I imagine the place will be mostly for take out orders as there isn’t much seating, but if they had more seats- they would be filled. 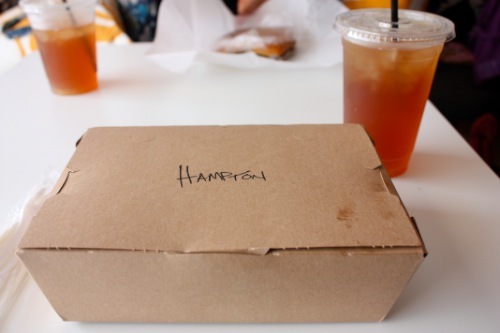 The food is fresh, satisfying, and reasonably priced. Even better, it did not take long to prepare! I hate eating lunch out and having to wait a long time, knowing that I have to get back to my work computer as soon as possible. At rybread, the sandwiches and salads are made to order, but there was less than a 5 minute wait time for our food. 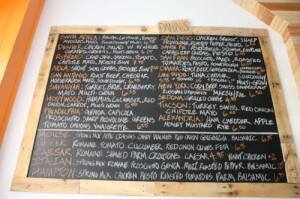 I love the menu and had trouble deciding between a few items. On this visit I decided to stick with the Change for the Feta salad challenge by having a salad, but I should have picked the Greek because it actually had feta! 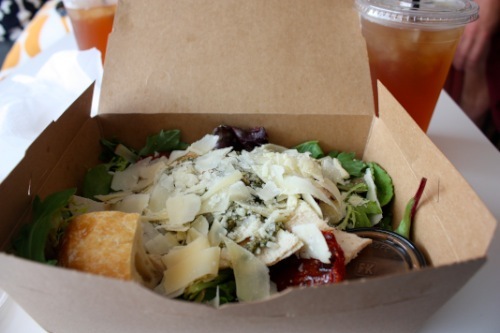 Instead I went with the Hampton salad, which contained chicken, pesto, sundried tomatoes, and fresh parmigiano reggiano with a balsamic dressing on the side. 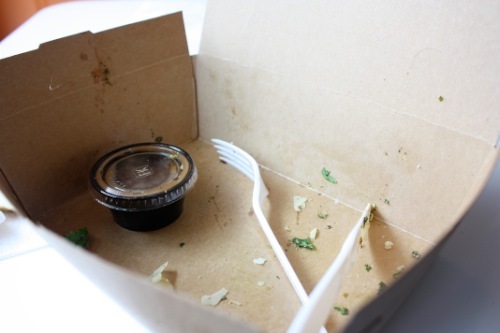 It was hearty and flavorful, and in fact I did not even need the dressing. It came with a small piece of bread that was perfect for eating all of the last little bites- I did not waste a single bit of this salad. Lisa went for the sante fe panino which had grilled vegetables and caramelized onions with pesto. It looked amazing! The presentation of the whole cafe in general was just right. It reminded me of the case studies of successful companies I used to study in college (one of my majors was in management). There was just the right amount of branding, and all of the small touches were noticed by a detail oriented person like myself. Everyone in rybread- employees and patrons alike- were kind and inviting. In fact, this was the first time I felt part of the Fairmount neighborhood. Since the indoor tables are kind of close I had the chance to see what other people were eating… Next time I will definitely have the Hollywood sandwich, which has hummus, red onion, shaved carrot and cucumber. Yum! 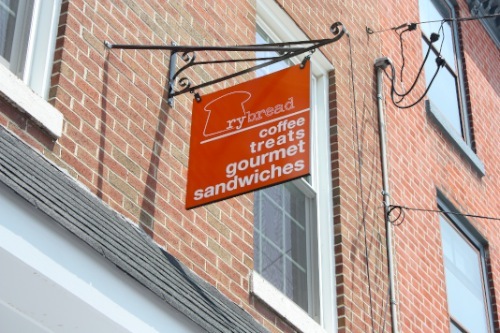 If you are ever in the Fairmount area, or even if you are visiting the Philadelphia Museum of Art, head over to rybread for a sandwich, salad, or fun treat! **By the way, I will now be posting on the weekends, so be sure to check up on the latest happenings at RhodeyGirl Tests all weekend! yum! your salad looks amazing! my boyfriend just moved into his apartment in fairmount and we’re headed down there tonight to finish setting up! i think this might be in my VERY near future. thanks for the rec, girl, and id love to meet up for coffee sometime!! @allison @ livingoneday, That happened fast!!!!! Let’s definitely meet up- I am emailing you now. Oh what a cute place! looks great! 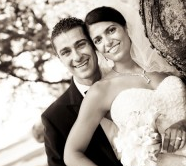 we will have to stop by there soon….always looking for a great lunch spot in philly! I love that salad, it’s always a gamble with a new place. Glad it worked out for you. 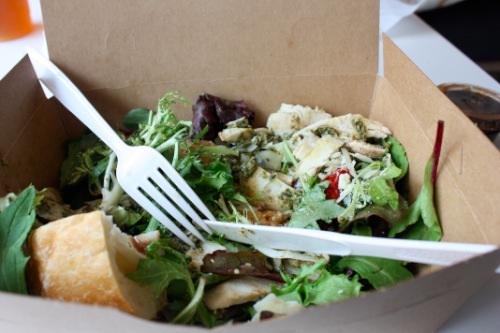 The salad looks so fresh and tasty, I have never seen one in a box! OMG, no wonder my pics are so awful on my site, I wouldn’t even know how to turn a camera that big on!